10 Amp Blue, Brown, Black, Grey & Earth H05VV-F Flexible Circular Wire for Indoor & Outdoor uses up to 500V such as Electric Motors, Heating & Cooling Controls, Central Heating Pumps, Low Voltage Lighting & Switching. 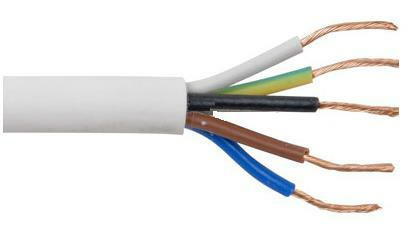 Plain annealed high quality stranded copper conductor with double insulated PVC protector sheath. Suitable for extra low (such as CCTV Supply) and low voltages up to a maximum of 500v.